When I receved my 6" F/8 Criterion RV-6 I was amazed at the detail I could see on Jupiter. Since then I have heard many others say how well their RV-6 scopes performed. Why did these scopes seem to perform so well? How do they compare to "modern": Newtonians like Zambuto mirrored scopes? I knew such a thing existed but I was not sure where to find it. Thanks very much. I have some drawings of the moon and Jupiter I made with my RV-6. I don't think it's just nostalgia, although I'm sure Nostalgia is a part of it. I'm not sure how such a comparison could be done fairly considering that Carl makes primarily fast mirrors and ones much larger than 6". Used 7" Oak Classic Starmasters easily fetch twice their original price if that's any indication. The Dynascopes that I've had a chance to use have performed very well. All the telescopes that I've used with Zambuto mirrors have performed as well as can be expected from fast Newtonians. I have an RV-6 that performs very well on the planets. There was an RV-8 on the top of the Strasenburgh Planetarium in Rochester, NY that provided excellent views. My buddy has an 8" f/8 Cave on a Star Liner GEM, and that puppy had the "best optics" reputation in our club for decades. I've never seen an f/8 "mirror of yesteryear" that wasn't excellent. soon to get a 2" Unitron. The RV-6 was just too heavy to carry up apartment stairs. Yet what views! The Double Cluster, the planets, and the moon! A good 6" reflector is a solid performer at r/8. I purchased an RV6 about 1965. It was and is excellent (I passed it on to my now 41 year old son, and its become his scope of preference.) I use a 10" Dob now, but still look back with fondness on that old RV6. Probably everybody's right. It's a combination of excellent optics, and adequate mount, and a substantial quantity of nostalga. I too once owned a 6 inch dynascope from 1985-1988 and I too REGRETFULLY sold it....I'll never forget that first view I had of VENUS as I tracked it for about 2 hours after the sun came up.....and Ive NEVER seen such a great view of venus in the daytime ever since....the RV-6 DYNASCOPE was not an over rated telescope ...the views were absolutely STUNNING !!!!!!! I've found one for $150 asking price. Do I jump on it before it's gone? Is it a good deal. OK.....somebody just say yes to all the above and let's get it over with. I'll just subtly introduce it to the collection, maybe my wife won't notice. I just used mine for the first time tonight, saturn is the only thing I can see thru the thin clouds but it looks better than I have ever seen it even thru the clouds! Hopefuly it will clear up later. How do you tell how old one of these things might be? Mine has almost no markings. On the focuser is CRITERION U-7, on the back of the mirror is 50" and on the tube someone wrote with a black marker P4-01027. The first two I understand anyone know the meaning of the last? The mirror had a THICK layer of dust on it when I got it so even tho this may not have been "first light" I'm sure it was the first light this thing has seen in a long long time. It wont be the last and I guess thats what these old telescopes are all about. and by comparing it with RV6 serials, by email, of the members there, you can probably come up with a pretty close date. This should work on the RV6 until BL started to manufacture them. After that I haven't a clue. Good luck. A fine telescope. I had one from 1974 until destroyed by fire in 2000. If there was any fault I'd say the EPs it came with (Achromatic Ramsdens) weren't the best. I borrowed some orthoscopics when I got it and used an erfle for low power. I would say the views were as good as any with any scope of comparative aperture. Never used it with garden variety plossls, but I suspect they'd be a good match for the scope. It does have a RA drive with a synchronous motor powered by 60 Hz AC. That's a bit difficult to get into the field, although I found the old Heathkit inverter worked okay. I suspect the more modern inverters from Wal-Mart would drive it adequately. No Dec motion control. You just had to nudge the tube. The friction clutch was problematic at one point. I replaced the cork with new cork and it operated smoothly for many years. My RV-6 as many others had fallen ill to tube destruction. To my benefit it was sold as is with only the primary, secondary,cell, and focuser, for under $50. I built the rest of the scope around my new purchase and i am VERY happy with the results. Great old post. You really had to go way back and blow the dust off this one, Tom! Well I always like to have an excuse to repost a picture of my restored 1960 or 61 original RV6. Yes the optics are as good as everyone reports. I agree with what others have written that the 6 inch at f/8 is relatively forgiving and if well made performs excellently even with a spherical curvature. After seeing a neighbors RV6 outperform my Astro Physics 6 inch f/8 triplet,(early model), I sold the refractor and restored my RV6 to almost like new condition. I just sold a RV8 8" f/8. It sure gave tack sharp images. I just bought a RV-6. So after 40yrs I now own one and I will get to see for my self how well they work. I remember the adds when I first became interested in astronomy 1967-69. 50 cents a week allowance and mowing lawns was not going to make me a owner of one so I am thankful there was Edmund Scientific to buy pieces for ATM. This scope is all disassembled so I need to do a little restoration and put it back together. So True Bill, I happened across a RV 6 for 100.00 with eyepieces and barlow. What a great scope. In the summer of 1969 on a family vacation, I had some great views through my Criterion RV-6 at Lake Tahoe (over 6000 ft elevation). 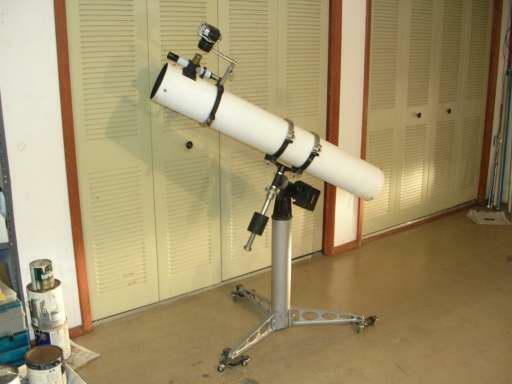 I had this telescope for a year before I sold it to help purchase my current telescope, a Cave 10". I had aperture fever and I had seen what a 6" could do and now wanted more! I wasn't disappointed but I do wish I had kept that RV-6. It was a cool telescope. Easy to transport and great optics. Maybe someday I'll get the courage to make my own 6" f/8 mirror and telescope. Thanks JimP for your post.